The First Class orange Machin self adhesive printed by Questa has been discovered incorrectly perforated. This was found in a standard folded sheet of 100 stamps. 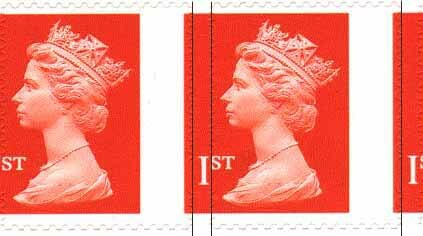 The perfs are displaced to the right so the ‘I’ of ‘Ist’ appears between adjacent stamps leaving just the ‘st’ on the stamp at the left. The white gutter normally between the stamps is at the right together with a small part of the adjacent stamp. We have added vertical lines to the image to show more clearly the edge of the perforations.